Read more to find out what PFC is about! Learn to Cheer Classes are a great way to try out our sport! Come see what its all about! We would like to sincerely welcome you to Prairie Fire Cheerleading. 2018 2019 marks our 13th year as PFC! 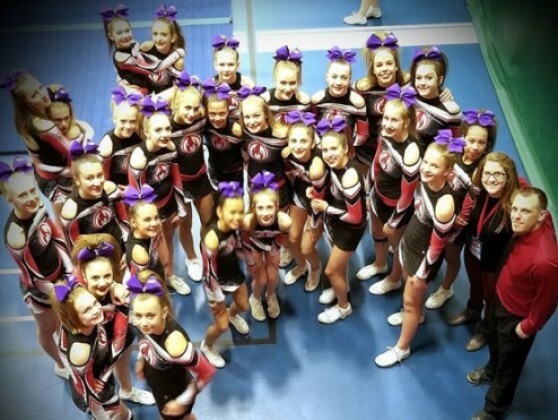 Our club simply began by providing cheerleading opportunities and active fun to athletes. Over the years it has grown into an organized, responsive and successful all star cheerleading club. Our club is supported by a group of individuals, a variety of teams and finally a family. PFC is a high quality facility where ALL individuals can train and live their dreams. We have worked hard to provide a second home to our athletes, a comfortable space for parents and the best training equipment and coaches in Saskatchewan, We look forward to meeting you and sharing PFC. Let us help you Find Your Fire! Our Tiny program is for young aspiring cheerleaders 6 years old and younger. Our Mini program is for proud cheerleaders ages 7-8 years old. Youth programming made up of 9-11 years old leads our gym. Welcome to the senior program, focused, determined and fun! Open Program: Fun trips, Reaching new heights, World Championships! We Cheer and we Dance!